An exceptional siding is one that not only provides durability, energy efficiency, and protection but most importantly, looks beautiful for a lifetime. Window World’s 4000 Energy Plus insulating underlayment adds strength and support, providing straight and true course lines, not the wavy or flimsy appearance sometimes associated with low-grade siding. 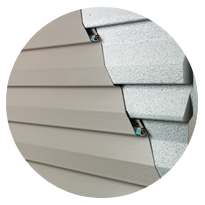 Think 4000 Energy Plus Vinyl Siding could be right for your Lake Charles home? Contact us today for your free home estimate!